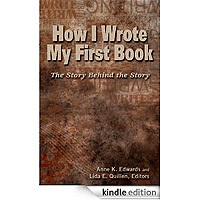 Twenty authors tell amazing stories about the efforts that went into writing their first book. Christine Amsden - "My Million Words of Crap"
Darrell Bain - "The Story Behind The Pet Plague"
Mayra Calvani - "Tips on Writing Your First Novel"
Lee Denning - "Two Beginnings"
Toby Fesler Heathcotte - "The Manuscript from a Mystifying Source"
Linda Langwith - "The Serendipity Factor"
Stephanie Osborn - "How a Rocket Scientist Becomes a Writer"
Along with articles by Bob Boan, D Jason Cooper, Susan Goldsmith, Ginger Hanson, Aaron Paul Lazar, Celia A. Leaman, Beverly Stowe McClure, Gerald Mills, Erica Miner, Bob Rich, Dorothy Ann Skarles and Dan Starr. Be inspired and be grateful for this amazing book!! They also generously give many good tips to make the process easier for those who are prepared to listen and don't want to reinvent the wheel and do it all the hard way. I love this book, in fact I still have not finished reading it and it is only the third book I have read of the 600+ I have on my beloved Kindle, including my own first effort, which I have edited and reedited, added to and subtracted from, published and republished it on Amazon Kindle many times. In fact, I feel this book has shown that while I have so much to learn, I am on the right tract and shouldn't feel guilty about all the editing I have done - it just shows, there is always room for improvement until you write the words "The End". Actually that's not true as Amazon Kindle Publishing means you can reedit and republish your book again and again if you wish! It has given me hope and allowed me to throw abandon - I think I mean caution, but I love the word "abandon" - to the wind and shake off the prospective writer's biggest curse - which is his or her own self doubts! Finally, many, if not all, the authors have added links to their other novels as well as useful resources and their own websites.